The great Ruby Walsh is universally considered as one of the greatest jockeys of the National Hunt. The Irish jockey's long career is extremely rich with achievements. He got injured at Punches town in a fall on last November and had been on the sidelines since. However, he is now preparing for a return at the mega Cheltenham Festival where he enjoys an amazing record. He said, "I could even be riding out by the end of next week. Things are going well; I just need to be patient and not do myself any damage. There's no real pain any more, but things can't be rushed." He remained associated with the great trainers Willie Mullins and Paul Nicholls, winning every significant race in the world of National Hunt racing. Every year, the festival at Prestbury Park brings all the best horses, jockeys and trainers in jump racing with every day having at least one major race for punters. And as the Cheltenham Festival is drawing ever near, we will give you the latest tips and offers so that you know where you can put your money. Besides the best free bets for Cheltenham, we will also give you the best odds for all the races of the Cheltenham Festival from the prestigious Gold Cup to the World Hurdle and the Champion Hurdle. Betting is so much more fun now with so many lucrative offers. Paddy Power will give you the £20 Risk Free Bet. With Betfair, you can get up to £100 free bets. While Coral is giving you the Bet £5 Get £20 offer and 888Sport will give you the Bet £10 Get £30. Along with the free bets, these bookmakers are also offering the special offers like the Best Odds Guaranteed and the Non Runner No Bet. With the Best Odds Guaranteed, the bookmaker will pay you at the bigger odds while the Non Runner No Bet essentially means that you won't lose your money if your horse falls on the racing day. His father is the former champion amateur jockey Ted Walsh while his sister Katie Walsh is also a top female jockey. He began showing his talents for racing from very early on, winning the the Irish amateur title twice. At just his first attempt, he managed to win the 2000 English Grand National on his father's trained horse Papillon. In the 2004-05 season Ruby Walsh grabbed 3 out of the 4 Nationals- the Irish Grand National, the Welsh National and the 2005 Grand National. He also holds one of the best Grand National records with two wins to his name. 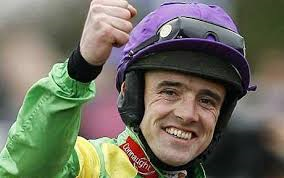 Ruby Walsh has the incredible record of riding over 2000 winners. He won 56 of these at the Cheltenham Festival. He also has the record of becoming the first jockey to ride four winners on the same day at the Cheltenham Festival. In the 2009 Cheltenham Festival, he established the record of riding seven winners over the 4 days. While he managed to equalize that record at the Cheltenham Festival of 2016. His other popular victories are the Cheltenham Gold Cup wins in 2007 and 2009 on Kauto Star, the 2004 Queen Mother Champion Chase on Azertyuiop and the successes at Queen Mother Champion Chase in 2008 and 2009. He won the 2006 King George VI Chase on the legendary horse Kauto Star. Not only that, he repeated the very same feat for the next three years by riding Kauto Star to win the King George VI Chase in 2007, 2008 and 2009. The Hennessy Gold Cup came to him twice on Strong Flow and Denman. Aboard Bluestone Lad, he completed the fastest ever century of winners in 2007. By the end of the 2006-07 season, he had a combined total of 198 winners in Ireland and the UK. While he ended the next season of 2007-08 by riding his 200th winner. He is the most successful rider at Cheltenham Festival with 56 victories to his name. Within the last 14 years, the great jockey Walsh has won the leading rider's award for 11 times. He also won the Australian Grand National in 2015 on Bashboy.